Facial fat transfer/micrografting is a revolutionary 3-dimensional approach to facial rejuvenation. It is performed to restore lost facial volume. Where most facial cosmetic procedures are designed to nip and tuck (cut away) “sagging tissues,” facial fat grafting expands the “sagging tissue,” recreating a youthful appearance. It is analogous to inflating a baloon that has lost some of its air. Since fat is a natural body substance, fat transfer can produce remarkable, natural appearing results and turn back the clock on your appearance. Where is the fat placed? 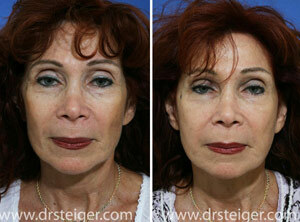 Your pattern of facial aging is analyzed by Dr. Steiger in a 3-dimensional fashion. The areas of missing facial volume are carefully marked for rejuvenation. Fat transfer can be performed around the entire face and temples, as well as in specific areas of your face (ie only around the eyes). Dr. Steiger commonly performs fat transfer around the eye to restore its youthful appearance. 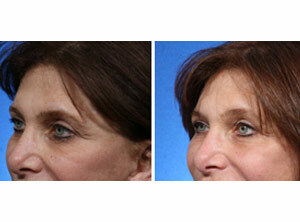 This is called framing the eye, and is an important concept of facial fat transfer. Since the eyes are the focal point of the face, restoring a youthful appearance to this area is essential to looking naturally more youthful. This involves both rejuvenating the eyelid itself, and the transition of the eye with the other components of the face, such as the cheeks and brows. Fat is also be placed in other areas of the face to rebalance facial proportions. In the prime of our facial youth, the face is generally heart shaped in appearance. As we age, this heart or inverted triangle falls and forms an upright triangle. 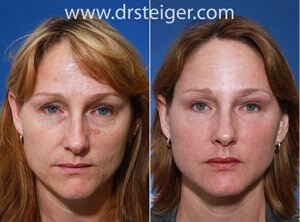 Dr. Steiger aims to rebalance the face and restore the triangle of youth. Dr. Steiger will determine exactly how to rejuvenate your face during your detailed consultation with him. We ask you to bring in photos of yourself when you were in your 20’s in order to help customize your treatment plan. Dr. Steiger performs facial fat transfer without any facial incisions, preventing any scars. No. Patients are generally surprised by the minimal amount of pain after the procedure. However, there can be some feeling of discomfort from swelling that occurs after the procedure. Where will you take the fat from? Fat can be harvested from the abdomen (belly), thighs, or several other locations. Once harvested, the fat is carefully processed and purified. The amount of fat removed for facial fat transfer generally does not change body contour or appearance. At what age should I have fat grafting? Facial fat transfer can be performed on a wide range of ages. For rejuvenation purposes, fat grafting can be performed as soon as facial aging begins to negatively impact your appearance. Facial fat grafting is a permanent procedure. Fat is a natural, living cell in the human body. When fat transfer is performed, the longevity of the graft depends upon the body accepting it by allowing it to form a new blood supply. Since your own fat is used, the body readily accepts its own fat cells. Once all of the swelling is gone, the fat that is left is permanent. Many patients see gradual results from this procedure up to 1 year after surgery. They note improvement in not only facial laxity/fullness, but the quality of their skin’s appearance as well.